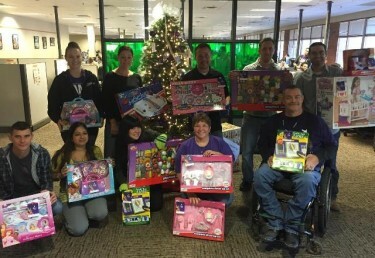 Team Murri, a group of employees in the Tempe office, are challenging other GCU staffers to choose a Halope (Lope with a halo) tag from the Christmas tree in their respective workplaces and shop for toys for less fortunate children in our community this long Thanksgiving weekend. The tags give information that is gender- and age- specific, and the toys are due back, unwrapped, to the office by Dec. 10. Members of Team Murri, back row, from left, are Alicia Spezzano, Stephanie Dixon, Jermey Murri, Travis Hardy and Joey Probst, and front row, from left, James Storey, Aasia Khan, Jenny Morales, Susan DeRemer and KJ Jones. Not pictured, Karen Tupper, Paul Smith and Reyna Vargon. Photo courtesy of Susan DeRemer.